Draft a circular letter to be circulated among your staff and students regarding the change in timing of college due to winter season. I am writing to you because I would like to inform you all regarding the change of timing of college due to the winter season. Since the winter season is here it means that the sun or natural light of the world will disappear sooner and night will come sooner. So due to this the timings of college have changed. Instead of coming in at nine AM you will come in at eight AM and instead of finishing at you normal times for whatever course you are on you will all finish an hour earlier in the afternoon. This will give you all enough daylight to get back to home safely. I hope that this works out better for you all and I look forward to seeing you all bright and early Monday morning eight o’clock. Due to immense requests from parents and students we are changing the timetable. Due to the winter fog many students are not able to reach the school on time. Many students come from far areas and the slow driving makes them late. Please note the change in the college timetable below. From now on, college will begin from 9 am instead of 8 am due to the fog in the morning. However, please pick your children up from school at 2 30 pm. For Friday the timings conducted will be 9 am till 12 30 pm. Students from Year 12 will have extra classes on Saturday as well and the timetable for that will be provided soon. Please pick up your children accordingly and note the new timetable down so it does not create any hassle for you or your child. The same timetable will be followed until further notification. Thank you for your co operation. For further inquiries you may contact the admin office. Application Letter to request for changing time of office, restaurant, shop, school etc. Suggestion for change of opening and closing time. I am writing to you because I would like to make a request. We opened last month and in that month we have got close to no business at all. I do believe that this is down to the timing of opening and closing. You see you have to know who you are serving and what time they like to eat. We are based in an area where people don’t like to go out in the night time and they are the type of people who like to go out in the morning and afternoon time. This is why I would like to request to change the restaurant opening timings. If we open early in the morning and close late in the afternoon I am sure that we would get more customers and more money. I hope that you will listen to what I just said and I look forward to seeing what action you take. Hope you are doing well. I have sent you this letter regarding my office timings. As you know that I am a student and was on a gap year so it was easy for me to work in the morning shift. However, as I have taken admission in a university too as a part time student so I have to manage my work and studies both at the same time. Unfortunately, working in the morning shift would no longer be convenient for me so I request you to change my working hours so I can work in evening shift. I assure you that there would be no effect on my work whatsoever and I will work hard like I have always been from the beginning. You can even check my record if you have any doubts at all. I hope I will get a very positive response from you. With all due respect I am writing this letter with a humble request to please change my timings due to some circumstances. Recently, my father has been very ill and it is difficult for me to take care of him since my timings end late at night. Rather than focusing on my work, my mind keeps wandering to whether my father is okay or not and this affects my productivity. I will be very grateful if you give me the morning shift instead of the night one until my father does not get better. I hope you will acknowledge my situation and arrange my timings accordingly. I am writing this email to request a change of timing for our meeting this Friday. It will be very difficult for me to arrive at 1:00pm, so I kindly request that we change it to 3:00pm. I would appreciate it very much. Application for shift change in office. Request letter to change working hours. Request letter for change of office time. It is to bring to your notice the happy news of my marriage. Next month 14 February 20XX I am getting married by the grace of Allah Almighty. I will be personally paying a visit to you soon to invite you to my wedding, as soon as wedding cards are printed. Sir, I am going to step into more responsibilities as wedding demands it, also that after marriage I will be shifting to my own rented apartment. Sir, it is requested to change my shift timings from evening to morning shift. Sir, I have had a good record in regularity and being punctual from last 3 years. I want to maintain my record being regular and punctual and achieve company’s yearly pay increments and other incentives. Sir, I am aiming high for I have to bear my expenses. Kindly accept my application and your humble approval is requested. I am writing to you because I would like to put a request in for changing the shift pattern in the office. All the office employee’s work a rotating shift pattern and it is always the same people same routine. I would like to chance this as I have a family and because of this the only time they get to see me is some time during the day and my kids are at school and sometimes at night and my family are asleep. This is not fair. I am not the only one who feels this way. I hope that you can change the shift in the office. I look forward to hearing back from you. I want to change my duty time from morning to night due to some personal reasons. My father is admitted in hospital so I’ve to stay with him at day time. Basically my younger brother is studying in school and he is not allowed leave. That’s why I’m requesting to you and it is company’s policy that if an employ wants to shuffle his/her duty timings he/she can request to company. Sample Request Letter for Approval of Change in Internal Office Timing due to late sitting of office for the staff members of any department. I would like to inform you that my vacations are over and my classes are starting from Monday and due to this I am not able to do day shift. I have already informed you that I am applying for MBA as I have to study further. I also cannot leave the job as I have to arrange my tuition fee for MBA. I request you to change my timing from day shift to night shift. I shall be really thankful for this favor of yours. Thanks. 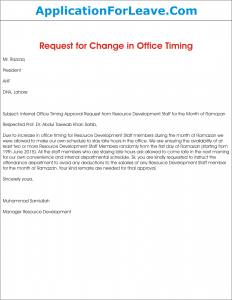 Due to increase in office timing for Resource Development Staff members during the month of Ramazan we were allowed to make our own schedule to stay late hours in the office. We are ensuring the availability of at least two or more Resource Development Staff Members randomly from the first day of Ramazan (starting from 19th June 2015). All the staff members who are staying late hours are allowed to come late in the next morning for our own convenience and internal departmental schedule. Sir, you are kindly requested to instruct the attendance department to avoid any deductions to the salaries of any Resource Development Staff member for the month of Ramazan. Your kind remarks are needed for final approval. 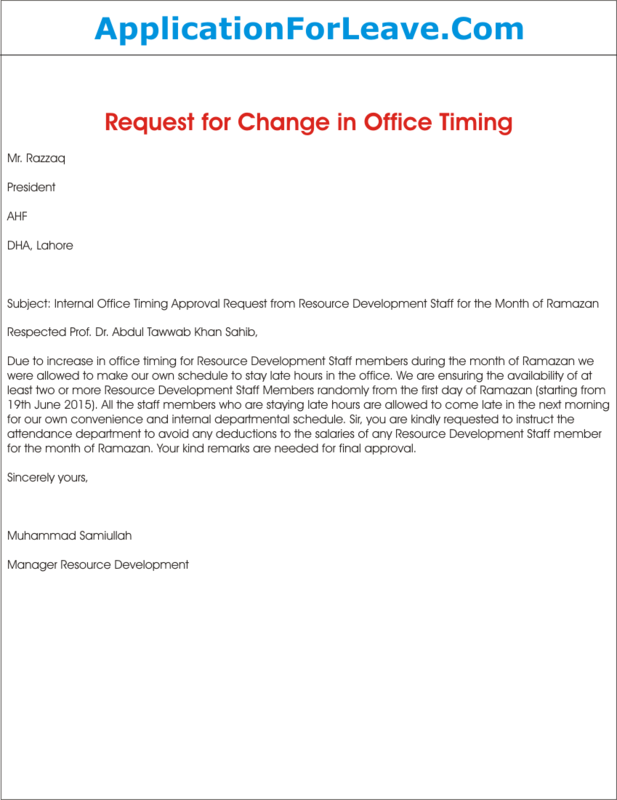 This letter is to request a change in internal office timings. Due to the cold weather there always remains dense fog at the morning. Many employees had experienced accidents of their cars and bikes in the morning. We all request the change the opening time of the office from 8am to 9.30 am. In order to complete the daily task all the employees have assented to work some extra hours in the afternoon or work for some extra hours in the half day. Please consider the application as soon as possible to safe employees from any sever accidents or problems. Glasgow Fire & Rescue Service. It has come to our notice that office timings for the staff performing duties in morning shift have been changed and new timings are 8 am to 5 pm (9 hours) whereas the evening staff works only for six hours i.e. 5 pm to 11 pm. There is a difference of three hours in duties of both shifts and morning staff also has to bear more workload than any other shift of the day. The workers in morning shift intend to change their duty timings; they demand you that there should be an equal distribution of working hours in both shifts. Keeping in view the above mentioned details, you are requested that approval for the change in office timings may please be granted with your keen judgment so that entire staff of the Service could work diligently.